The Henley Royal Regatta has always been a tradional event in the english summertime, finding that perfect outfit can be a struggle. Girl Meets Dress have a large collection of Henley dress code approved dresses, If you are looking for a floral dress, pastel dress or even a bold dress Girl Meets Dress can help you find your pefect fit. Here are our top picks of what to wear to the Henley Royal Regatta. WHERE & WHEN: From Wednesday 2nd July to Sunday 6th July Henely Royal Regatta is based along the banks of the river Henley-on-Thames. WHAT TO WEAR: The spectators are traditionally decked out to the nines and there is also a strict dress code for those within the Stewards’ Enclosure. 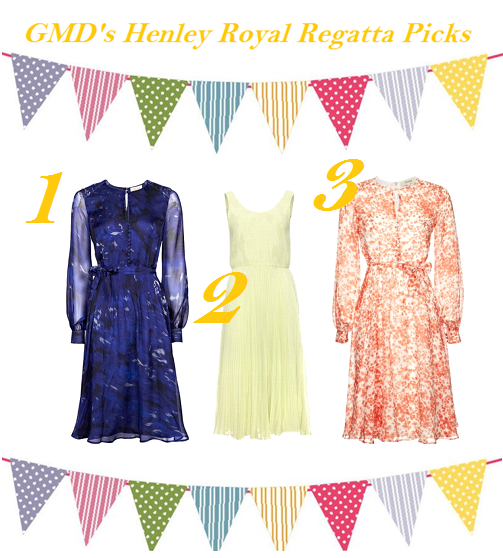 To make sure you stand out as a well dressed spectator here are our top picks of what to wear to Henley Royal Regatta. the length is perfect for the strict dress code and the deep blue hue is sure to make you the envy of everyone. the soft pastel yellow is the perfect ice cream shade for a summer event. This Beulah Blossom dress is lovely! The delicate sprinkling of colour and the light summer fabric make this the perfect dress to hire. Posted June 25th, 2014 in Features. Tagged: Girl Meets Dress, GMD, Henely Royal Regatta, hire a dress, summer dresses, Summer events, what to wear.